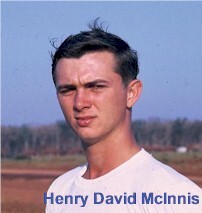 My brother, David McInnis, mailed home several 35mm slides. Would you be interested in them? If you are interested, please let me know. Thank you. Editor's Note: Jo Ann submitted three disks with over 100 photos from slides taken by her brother David. Those photos are posted on Jo Ann's corner at Contributor's Corner at Ktroop.com. I remember our childhood fights and arguments over the most trivial things. I am proud of his bravery and I miss the man that he would have been.